Could This Be The Coolest Super Nintendo Mod Ever? Daring; inspired; unusual; this SNES mod does it all. There's something undeniably alluring about modded consoles. Sometimes they're custom-built to provide a wide array of gaming options; other times they're sleek and purpose-built; they're even sometimes deliberately downscaled to provide familiar functionality with micro-sized portability. This latest Super Nintendo Entertainment System mod, however, is none of those. Instead, its creator seemed to take a jam-everything-into-the-main-unit approach, and though the result seems silly at first, it might actually be one of the most unique and envious SNES mods to date. This mod looks to be coming by way of user @huxarufaxara, who shared a video of himself playing the portable via Twitter. The device itself, as can be seen in the above video, is modified in an unusual manner: the shell of the console was used as the unit's housing, and the SNES controller was simply placed into a controller-shaped cutout on the top of the console. A screen was placed just above the cartridge port, and the cartridge port itself was relocated to the back (or what can now be considered the top) of the unit. Speakers were obviously placed at an unknown location within the unit, likely in-line with some sort of amplifier, and one can only assume there's a battery pack hidden somewhere in there, too. 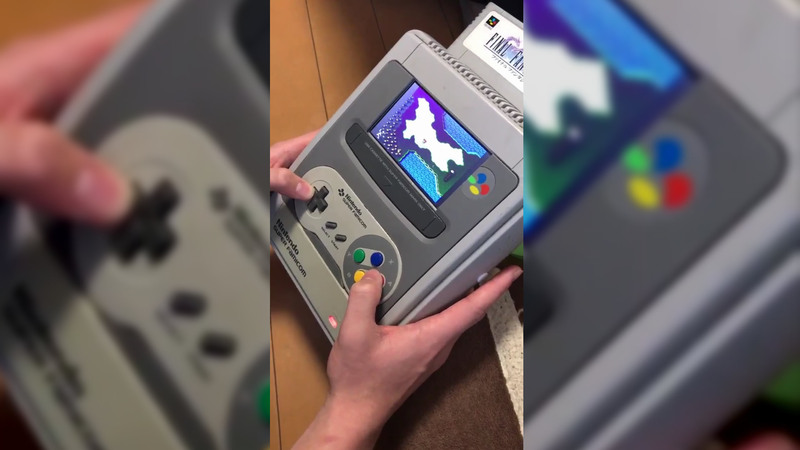 This is technically what would be called a portable SNES mod, but seeing as how the unit is crammed inside an otherwise-stock Super Famicom housing, the console itself is neither ergonomic nor small enough to be considered feasible as a portable gaming system. With that said, this console stays true to the original system's design moreso than most of its modded brethren, which bestows upon it a considerably-high cool factor.